← Happy Birthday Mr. Tolkien! Brandon Sanderson is coming to Phoenix to meet fans and sign copies of his latest YA adventure, Firefight. Taking a break from writing a million or so new books this year, Brandon Sanderson has announced the dates of his latest signing tour in support of his new novel Firefight, which hits stores on Tuesday, Jan. 6. Changing Hands Bookstore is bringing him to an undisclosed location on Wednesday, Jan. 21. Lest my non-local readers feel left out, here is a full list of other appearances across the country. Purchase of Firefight from Changing Hands is required for admission to this signing. 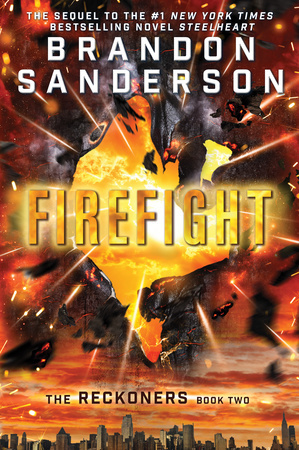 Firefight is the second in Sanderson’s YA series “The Reckoners”, after the 2013 novel Steelheart. Set in a dystopian world where superheroes, called Epics, have installed themselves as despotic rulers over city-states, the novel follows David, a teenager who killed the High Epic, Steelheart, who ruled over Newcago. In the new novel, David must journey to Babylon Restored, what was formerly Manhattan, to face the High Epic Regalia, who holds answers regarding a mysterious Epic named Firefight. Tickets are required for the event, and are available with purchase of Firefight from Changing Hands. And even if you can’t make it, you can order a signed copy and they will ship it to you, even internationally. This entry was posted in News and tagged Brandon Sanderson, changing hands bookstore, Firefight, Reckoners, Signing, Tempe. Bookmark the permalink.